Pro-E Design, LLC is focused on providing professional, high-level engineering design and support to individuals and companies in need. See 'Engineering Services' link for a full description of services. 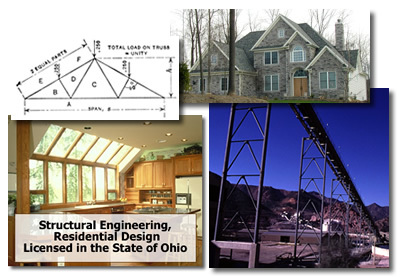 Pro-E Design LLC prides itself in a commitment to quality in the field of structural engineering and design. An experienced, licensed and degreed engineer will personally handle your project. Located in Northeast Ohio, Pro-E can give you the time and personal touch you need to guarantee that your project is completed to your satisfaction. Should you require a structural analysis, construction design or an expert in the field, Pro-E Design is the right company for you. © Copyright 2005 Pro-E Design, LLC. all rights reserved.